The Angriest: Star Trek: Voyager: "Twisted"
It is 2 October 1995, and time for another episode of Star Trek: Voyager. Voyager collides with an unexplained phenomena in deep space, causing the entire ship's layout to warp and twist into a nonsensical maze. As the crew begin searching for a way to reach the engineering deck and bridge, it becomes clear that the distortions are spreading and time is running out. "Twisted" is another episode of Voyager that was produced for the first season but delayed upon Paramount's instruction to the beginning of the second. It famously under-ran in its original edit, by a jaw-dropping eight minutes, and that necessitated a lot of additional dialogue and padding to fill a commercial hour. The end result is something that might have made an intriguing short film but which stretches at full length to a lethargic bore. Rather frustratingly, there is a genuinely good science fiction premise at the episode's heart. 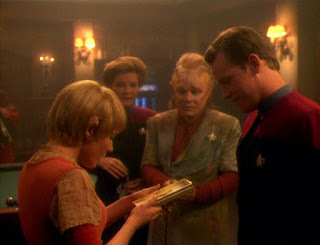 Voyager doesn't simply collide with a naturally-occurring phenomenon: this is a first contact scenario with an alien species so unlike what is expected that the Voyager crew cannot even recognise what is happening. With a smarter and better structured teleplay this could have been a pretty great episode. Instead the audience is stuck with a lot of padding and recycled weak character conflicts. Chakotay (Robert Beltran) doesn't like how Tuvok (Tim Russ) behaves again. Neelix (Ethan Phillips) bristles with jealousy over how Paris (Robert Duncan McNeill) acts around Kes (Jennifer Lien) again. Harry (Garrett Wang) is young and nervous again. It all feels rote, and therefore dull. Whatever the science fiction elements, the episode does not stand a chance. And the padding is just mystifying. Quite how a crew of professionals, many of whom have worked on the Star Trek franchise for years, manage to under-produce an episode by eight minutes of screen time is a complete mystery. It is stunningly inept, and the episode pays the price. We're now six episodes into Season 2, and only two have been properly enjoyable. The quality ratio drops to 33 per cent.